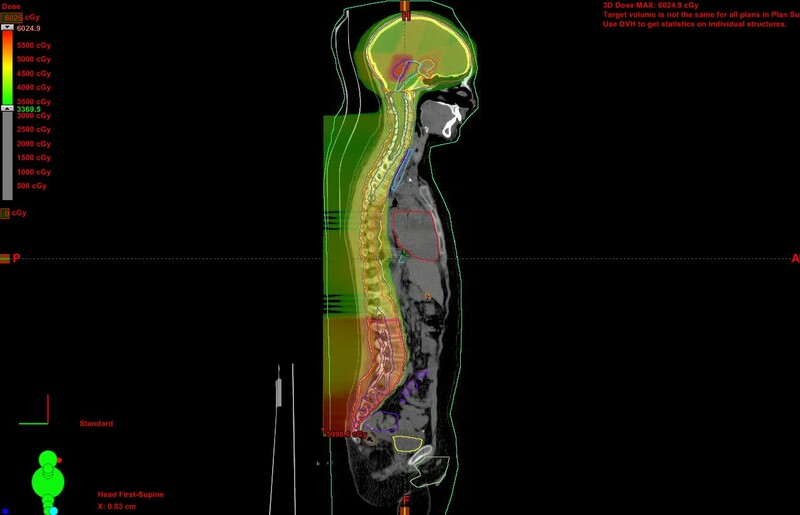 The advantage of using PBT instead of photon radiation therapy is that its characteristic Bragg peak property to stop at a precise depth in tissues with no dose beyond that point enables a radiation dose to be delivered with precision, with significantly reduced volumes of irradiated normal tissue. This is particularly beneficial in preserving normal tissue or organs adjacent to a tumor that never should be exposed to radiation, such as the cochlea and hypothalamus. When adjacent organs and tissues are damaged, patient quality of life can be severely and permanently impaired. In the United States, insurance coverage depends on the insurance company in question or if the child is a Medicaid patient. Proton therapy is much more expensive than conventional photon radiation therapy and is still not supported by level 1 evidence. Because no randomized clinical trials are underway comparing photon radiation therapy with PBT, insurance coverage differs. Some policies restrict PBT to specific pediatric tumor types, others have an arbitrary age cutoff, and others do not explicitly deem PBT medically necessary. To determine whether insurance companies approved or denied PBT treatment in a real-world situation, radiation oncologists at the University of Pennsylvania School of Medicine in Philadelphia examined medical and billing records from 2010-2015 of all patients under age 18 with a pediatric malignant tumor, or between age 19 and 30 with a pediatric primary tumor who were judged medically appropriate for PBT. The authors strongly recommend streamlining the approval processes by health insurance companies to treat appropriately vetted pediatric cancer patients. They suggest creating special pediatric codes or having payors modify insurance policy language in the United States that explicitly denotes coverage for pediatric cancer patients. In all likelihood, randomized clinical trials comparing treatment with photons and PBT would never be approved by hospital ethics committees. However, many observational studies have been conducted by single-center institutions. And with the increasing number of proton therapy centers in operation throughout Europe and the United States, large-scale collaborative studies are becoming feasible. Fifteen radiation oncologists and medical physicists from Austria, France, Germany, Italy, The Netherlands and the United States have issued a clarion call for large-scale collaborative studies. The National Association for Proton Therapy reports that 26 treatment centers are operational in the United States with 9 more under development. An additional 21 PBT centers are in Europe, 17 in Asia, and 1 in Africa. The number of children treated at these centers is now sufficient for large-scale observational studies to assess short- and long-term benefits and risks. Lead author Amy Berrington de Gonzalez of the Division of Cancer Epidemiology and Genetics of the National Institutes of Health’s National Cancer Institute, Bethesda, MD, and co-authors state that despite a surge in PBT, few studies have assessed its potential benefits or risks. In a commentary in the International Journal of Radiation Oncology Biology Physics, they note that there are potential risks from the greater uncertainties regarding the radiobiology of protons compared with photons, and whole-body scatter doses from neutrons from passive scattering delivery systems and proton interactions in the patient. Pediatric brain tumors are the most common type of solid malignant central nervous system tumors. Advances in multimodality treatment combining surgery, chemotherapy, and radiation therapy have extended patients’ lives dramatically. However, late toxicities caused by radiation exposure can impair growth and cognitive function, and cause brainstem injury, hearing loss and vasculopathy. Glioma. In patients with unresectable low-grade glioma or residual disease, PBT may preserve reading ability compared to photon RT and provide comparable progression-free and overall survival. Radiation doses to the contralateral optic nerve, chiasm, pituitary, temporal lobe and frontal lobe can be significantly reduced. Medulloblastoma. Because this tumor has a propensity for leptomeningeal spread, cranial-spinal irradiation is necessary. Intelligence retardation, hormonal deficiencies, hearing loss, and short stature are common, quality-of-life impacting late toxicities. PBT treatment can reduce radiation doses to the cochlea, temporal lobe, hippocampus, and hypothalamic pituitary axis, reducing the risk and severity of tissue damage. Ependymoma. Radiation therapy is a secondary treatment that follows surgical resection of tumors in the posterior fossa. PBT significantly reduces radiation doses to the temporal lobe, the hypothalamus, and the cochlea. However, brainstem toxicity in pediatric patients has been reported with both intensity-modulated radiation therapy (IMRT) and PBT. Germinoma. This is 1 of 2 types of germ cell tumors. It may be treated with chemotherapy and radiation therapy, with the method of radiation therapy determined by histologic type, metastatic extent, and patient age. PBT has been used for whole ventricular irradiation, delivering a lower radiation dose, but it is not yet known if and how PBT causes late toxicities. Craniopharyngioma. Studies are showing that survival, disease control and toxicity between IMRT and PBT are equivalent. However, PBT treatment does reduce radiation dose to the total brain, cochlea and hypothalamas, and may minimize intelligence diminution. ASTRO news release - ASTRO updates insurance coverage recommendations for proton therapy. July 13, 2017. https://www.astro.org/News-and-Publications/News-and-Media-Center/News-Releases/2017/ASTRO-updates-insurance-coverage-recommendations-for-proton-therapy. NHS England. Clinical commissioning policy: proton beam radiotherapy (high-energy) for teenage and young adult cancer treatment (2017) and NHS England. Clinical commissioning policy: proton beam radiotherapy (high-energy) for paediatric cancer treatment (2014). Ojerholm E, Hill-Kayser CE. Insurance coverage decisions for pediatric proton therapy. Pediatr Blood Cancer. 2017. Published online August 7, 2017. Berrington de Gonzalez A, Vikram B, Buchsbaum JC. A clarion call for large-scale collaborative studies of pediatric proton therapy. Int J Radiation Oncol Biol Phys. 2017;98(5):980-981. Mizumoto M, Oshiro Y, Yamamoto T. Proton beam therapy for pediatric brain tumor. Neurol Med Chir (Tokyo). 2017;57:343-355. Pediatric proton therapy: Payments, call for studies, and benefits for brain cancer. Appl Rad Oncol.